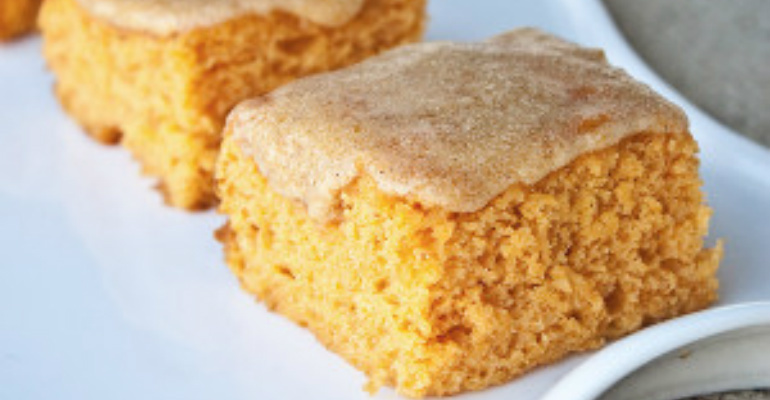 That’s the thing about pumpkin… it always makes baked goods moist! It’s like a miracle ingredient I swear! Give this a try before judging and you will see why it’s an easy favorite for all! Mix angel food cake mix, pumpkin, and 1 tsp pumpkin pie spice in a bowl. Pour into a greased 9 X 13 in cake pan. Bake for 25-30 minutes or until a toothpick inserted comes out clean. Let cool. In another bowl, beat powdered sugar, hot water, vanilla and 1/4 tsp pumpkin pie spice together. Drizzle over the top of the cake and cut into squares. Quick Tip: Eat this fresh out of the oven and give it a squirt of Reddi Whip if you like! Thank you to Recipe Lion for this awesome recipe!